Raising agents (yeast, bicarbonate of soda and baking powder) work by adding carbon dioxide (CO2) gas to your mixture. This is produced as bubbles, which rise and add volume to your baking. Yeast works by a fermentation process; they eat the sugars in your bread and ‘breath’ out carbon dioxide. But this is quite a slow process, which is why to leave bread to rise, and not always suitable for cakes and lighter baking. Bicarbonate of soda, sodium hydrogen carbonate (NaHCO3) is the quicker alternative for cakes. This releases carbon dioxide when reacted with something acidic (like fruit, buttermilk or honey). This acts straight away, that is why you can’t leave your baking batter for long before you put it in the oven. But, if you’re baking something without the acidicness (i.e. chocolate chip cookies) you’ll need to use baking powder. In your baking powder is an ‘in built’ acid – usually cream of tatar (potassium hydrogen tartrate KC4H5O6) and when this released with moisture it reacts with the bicarbonate of soda to release the carbon dioxide. Where did structure come from? 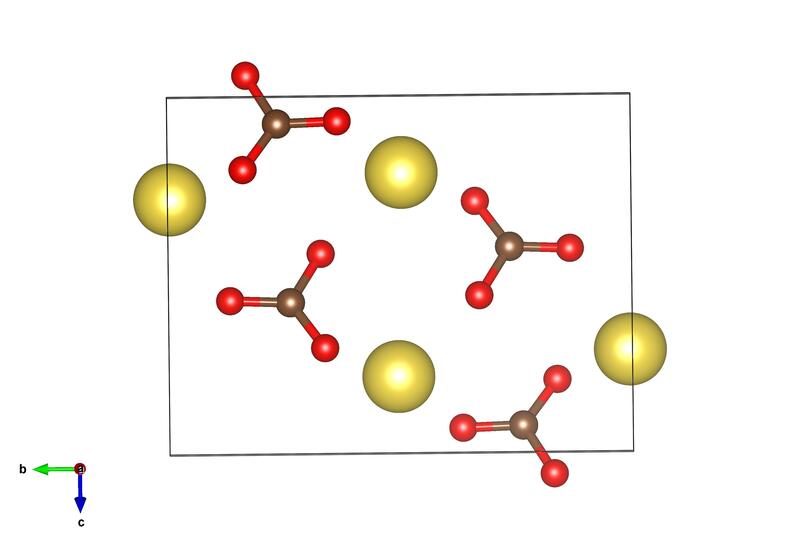 Cerium gold silicide is a 1-2-2 material. The chemical structure was the subject of a previous blog post. The structure is tetragonal. 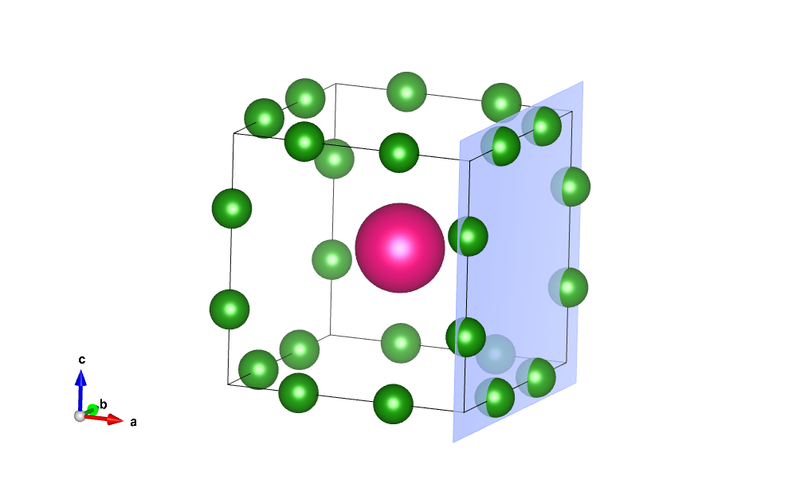 In this image the cerium is shown as light green. The gold is, well, gold. 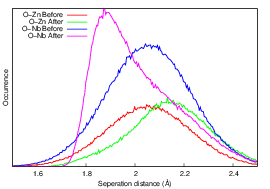 The silicon is shown in blue. Back in the original blog post we pointed out that ternary compounds such as this have a broad range of properties depending on your choice of element, and it’s not uncommon for materials which have been known for ages to reveal fascinating properties when looked at in a new way. 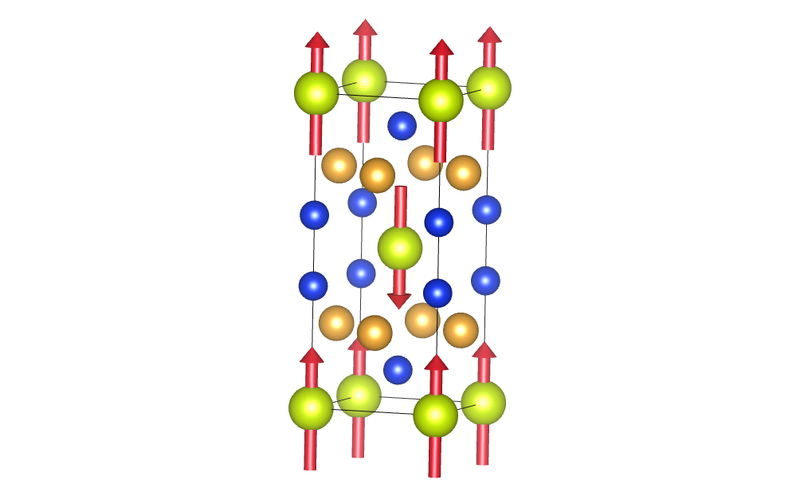 CeAu2Si2 is an antiferromagnet at low temperatures (say 5K). The red arrows show the magnetic moments of the cerium atoms that give rise to the antiferromagnet. 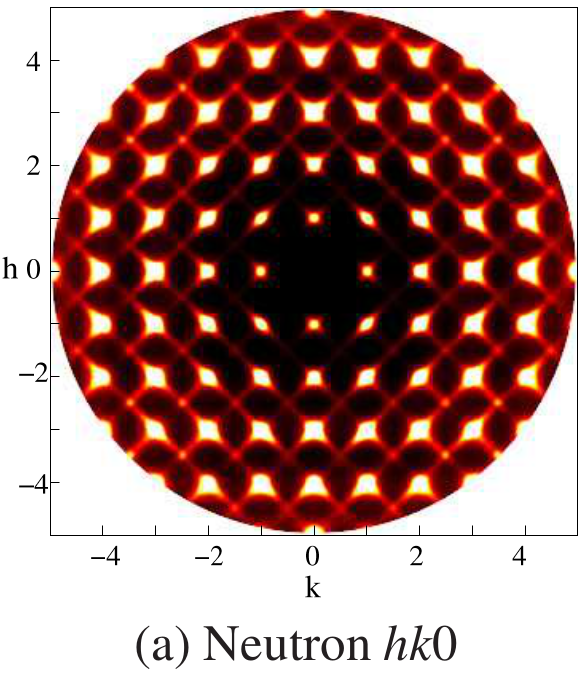 This magnetic structure was determined by neutron scattering and published in 1984. The structure was done as part of the series CeM2Si2 where M = Ag, Au, Pd, Rh so you’d guess their research budget must have been pretty good that year. The work was done at the research reactor at the Brookhaven on Long Island in New York, which was controversially shut down after lobbying by celebrities from the nearby Hamptons. (The story’s a bit more complicated than that, but it’ll do for now). Anyhoo, a recent open access paper shows that this material is very interesting at high pressure. Between 11.8 and 22.3 GPa, the material is superconducting below about 2K. Then between 2 and 5K (or thereabouts depending on the pressure) it’s magnetically ordered. So the phase diagram has both superconducting and magnetic phases in it. It used to be thought that magnetic and superconducting phases were “antagonistic” to use a phrase from the paper. In other words a material could be one or the other but not both. But about twenty years ago a material was found which could switch from magnetically ordered to superconducting . In fact this was another 1-2-2 material (CeCu2Ge2). What makes CeAu2Si2 interesting is that this co-existing range of over 10GPa is much broader than previously observed. 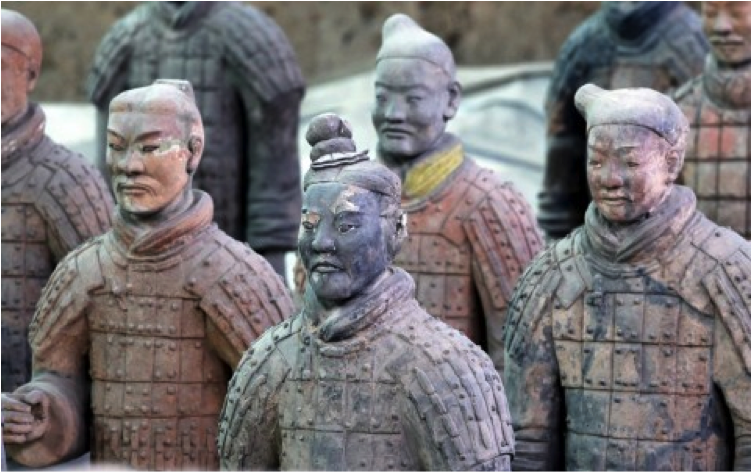 It just goes to show how “old materials” can yield new insights. 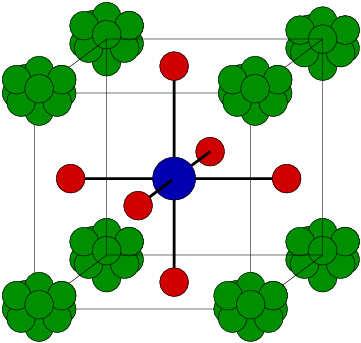 The magnetic structure was published as: B.H. 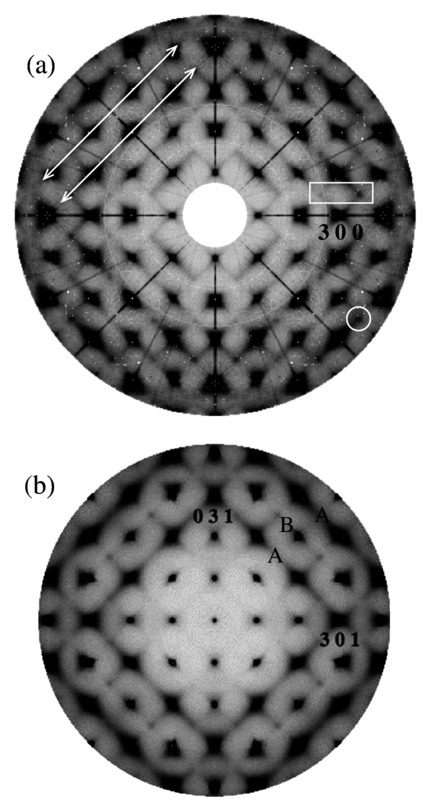 Grier et al, Phys. Rev. B. 29 (1984) 2664. The paper also has a good summary of the overall chemical structure. Zinc nitrate is one of those materials that every chemist has in their cupboard. It’s very deliquescent, meaning that it will absorb water from the atmosphere. The reason we chose to feature it today is that we stumbled upon this beautiful video, on the RI Channel. This shows, among other things, beautiful zinc nitrate ‘trees’ growing – silver atoms are being substituted for zinc as the material is re-crystallising.